The bog standard spit can be removed with a long high-tensile bolt with the end cm or so of thread ground off to force the wedge out and an extended tommy bar socket. Only hand spits (probably what you mean by bog standard) and only if the thread is still good, and even then not reliably, the thread often (limited trials) fails. Not when the threads have gone. One of you is confusing the terminology. I always reserved the word Spit for self-drilling genuine Spits. Sam included all drop-ins which is OK because Spit also make drop-ins. Many people are aware of the confusion and take account of it. I think some people would call these type of drop-ins "spits" too - not always possible to tell them apart from a self drill when in the cave. The wedge is "captive" in these and a "setting tool" is used to drive the wedge in. I can think of one or two spots that still have spits (and no doubt others will add more) but I doubt we'll bother with core drilling, just find a nearby placement as we did in winnats head last year. Yes that is generally what has been done, I have done it myself, but should we not be thinking about conservation and protecting a limited resource? Would you leave a chocolate wrapper in a cave? I hope not, does it make it any better if you cover the chocolate wrapper with a rock? Just a thought. I started installing anchors in caves in the early 1980's and I was always led to believe that 'Spits' were the self drilling anchors that, once installed, you would break off the top section of the bolt with the special driver and then install a traditional hanger plate. The break, unfortunately, wasn't always clean and could damage the driver and/or the hanger. I've never actually seen one but i'm sure there is a photograph of one in a caving book. Not one I have unfortunately. I think you might have to be over 50 to remember them. I think it's just been a continuing tradition to call all drop-in type anchors 'Spits'. The videos of removing an old self drilling anchor and re-installing the new 'Twisted' anchor have me confused. Is that not a diamond core drill? I thought the recommendation was not to use a diamond drill bit for the new anchors. I assume the hole is then 'roughened' with a standard 16mm drill bit? The removal did look easy though. However, when the bolt is in anything other than the horizontal and you haven't got a coolant pool and instead of being stood up in your casual clothes on a nice day, you will be trussed up with all your caving gear whilst suspended from another bolt with a big heavy drilling machine in one hand, at arms reach and water trickling down the back of your neck through the gap in your oversuit!!! It would have been nice to see a fully installed anchor with all the excess resin removed from the rock around it and, in particular, around the lower inside section of loop where ultra-lightweight alloy carabiners and 9mm ropes (as referred to in another thread) may be attached directly. Excess resin that is not removed from here and allowed to set hard could, subject to a dynamic load, lead to the catastrophic failure of the carabiner or, more likely, the rope. 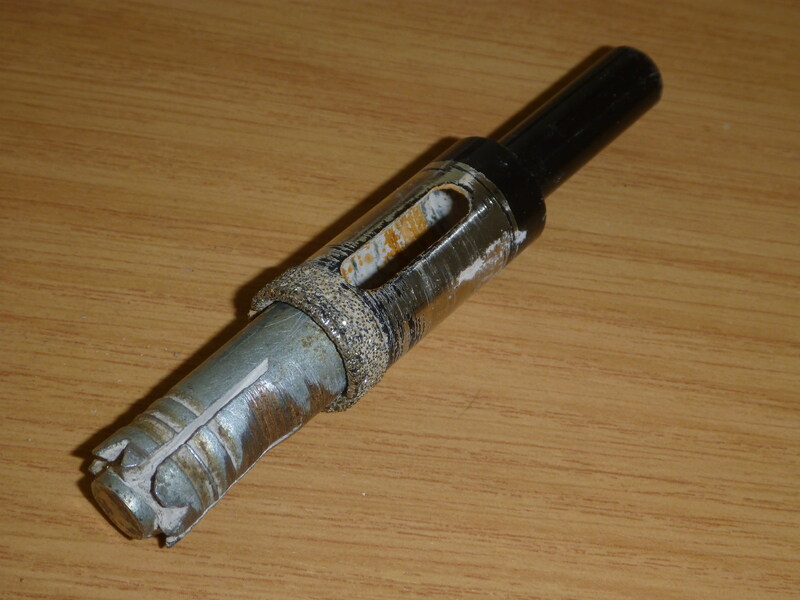 Remember the tests carried out to determine 'Full Strength' of lightweight connectors and ropes use a 10mm round bar, not a jagged piece of hardened resin. Yes it was in a pool of water, first go, so not sure how hard it was going to be, so to be safe dud it in a puddle. I did not actuality place an anchor in the hole, just showed it in the video to show it would work. Since the video, I have done one in a cave that on a wall, very little water was needed. In this hole I did roughen after with a normal drill. As for placing the anchor, yes leaving to much resin in the anchor eye makes it difficult to use, the resin around the back of the eye is needed to stop rotational failure. The small bits inside and nearly impossible to wipe out when wet, but when as thin as shown in the video it breaks off on first use leaving a clean eye, hopefully not leading to the problems you gave described. The break-off ones were earlier and were called Redheads - horrible things - even worse than Spits. Redheads. Thanks for that reminder Simon. You obviously do have to be over 50. You wouldn't want to wobble much with such little clearance between the inside of the drill and the old anchor, particularly near the spayed out bit at the bottom. I bet it would kick a bit if the core drill snagged it. The dimond appears to drill through it not snag, marks where I did it further up are visible on the photo. Is the document linked in last post still available elsewhere? I was wondering if any tests had been done on resin bolts without glue, as that would model worst case fixing scenario ? (Must confess I haven't reread all 6 pages). Also, from holes that are slightly too big, as would like to know how much wear removable bolts can cope with? Does http://british-caving.org.uk/wiki3/doku.php?id=equipment_techniques:anchor_scheme provide some useful information on the topic? Also IC anchors has good stuff, see the testing and removal pages at http://www.resinanchor.co.uk/. I have PMed you as well.